Father's will for our lives. 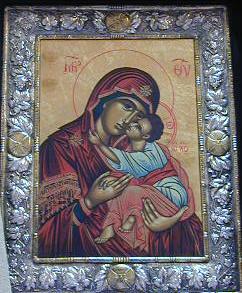 under her special Orthodox Church title, the Theotokos. the promptings of the Holy Spirit. The Order of Mary Theotokos (OMT) is a religious order, similar to a Third Order in the Roman Catholic Church, open to people of all Churches and Faiths who wish to live their lives as professed religious dedicated to the Blessed Virgin Mary, the Mother of God. People (men and women, married and single, ordained and laity, old and young, able and disabled) who make this special profession to live a life of love of God by following the example of Mary the Mother of God, give over their lives to the will of God through prayers and good works. While there is no monastery or other central place owned by the OMT, members associate and share their lives of prayer and good works through electronic association with other members in the OMT egroup. Further, members are welcome to extend their association with other OMT members by participation in the spiritual activities and annual Retreat of the Ecumenical Catholic Church+USA. While the traditional ideal of an "Order" in the monastic sense separated members from the world to develop and serve a specific community of religious, the OMT member values and uses his/her life in the world to develop, along with our Savior Jesus Christ, the kingdom of God on earth. The goal of the OMT member is to bring "all things together in Christ" and with Christ to build this world, brick by brick -- so to speak, until Christ takes what we together have built and raises it up to the Almighty Father as the best fruits of our labor. The OMT member lives a simple Holy Rule of Life which includes prayer, good works, and special dedication to the example of Mary, the Mother of God. Just as Mary was asked by Almighty God to bring his Son, our Lord Jesus Christ, into this world, so the OMT member is dedicated to bring Jesus into this world of ours. All Christians are called to be the "body of Christ" today in the here and now of human existence. Members of the Order of Mary the Theotokos are called and dedicate themselves in a special way – an act of solemn profession. 1) To lead a God-centered life dedicated to the mission of Jesus Christ, as Mary did. 2) To organize his/her life around prayer and good works for the glory of God, as Jesus and Mary did. OMT members offer to God their daily prayers of reading from the Holy Scriptures, spiritual reading, lives of the saints, meditation. The official prayerbook of the OMT is the Magnificat publication (available at www.magnificat.net) which gives daily morning, evening and night prayers based on the Psalms and Sacred Scripture, a meditation on Mary, a brief account of the life of a saint, and the Liturgy of the Eucharist which enables the OMT member to join with all others in the Catholic Faith tradition through spiritual Communion with our priests or actual reception of Holy Communion if the Celebration of the Eucharist is available to them. 3) To love God's creation, protect it, nuture it and bring it with Jesus to the fulfillment that the Creator intended when he sent his Son, Jesus, to redeem it. 4) To live a life of loving God first, and neighbor as self. The great commandments that Jesus gave us and Mary showed us how to live through her life. The living of the details of this Holy Rule of Life is as unique as each one of us! God's will be done! What do I have to do to become a professed member of the OMT? Request an application. Your application will be sent to you by email. Live as a Postulant for six months following the rule under the guidance of the OMT pastoral director (email correspondence). After six months, petition to make your First Profession for one year as a religious in the OMT. After one year, petition to make your Solemn Profession for life as a religious in the Order of Mary Theotokos. While it is preferred that members make their Solemn Profession at the ECC+USA annual retreat, the Pastoral Director and you will work out the details how this can be done in your individual situation. Once I have made my profession may I add OMT behind my name? Once you make your Solemn Profession, you may if you wish add OMT behind your name. You may also use the title Brother or Sister once you make your First Profession. What is the relationship of the OMT to the Ecumenical Catholic Church+USA? The OMT is an independent spiritual ministry within the Ecumenical Catholic Church+USA intended to foster devotion and dedication to Mary, the Mother of God. You do not need to belong to the Ecumenical Catholic Church+USA. You may belong to any Church or religious Faith, or even none at all. However, you do need to intend and commit yourself to the purpose and Rule of the Order. Does it cost anything to join the Order of Mary Theotokos? No, there are no application or membership fees. Obviously, donations to the work of any ministry are always welcomed and appreciated and the OMT is no exception. Let the Pastoral Director know if you are ever interested in making a tax-deductible donation to the OMT. All members of the Order will be asked each year in March to make some voluntary and unspecified financial donation to assist the on-going work on the Order. As a member of the OMT what are my rights, privileges, and obligations? For a list of themes and topics in the Theotokan, click HERE. Sharing in the prayers and good works of all other OMT members and the clergy of the ECC+USA. After First Profession adding OMT after your name to proclaim your membership and profession to follow the example of Mary, the Mother of God, in her love and obedience to God the Father and her Son, Jesus Christ. Invitation to attend the annual Retreat of the ECC+USA. Receiving the quarterly electronic newsletter of the OMT, the Theotokan. Live the OMT Holy Rule of Life to the best of your ability. Prayer for the intentions of other members of the OMT. Submit the annual report and maintain at least semi-annual contact with the Pastoral Director of the OMT. Promote membership in the OMT through word and example within your sphere of influence. All OMT Brothers and Sisters are required to designate some place in their home as their prayer space. It can be as simple as a chair in a quiet corner of a room, or as elaborate as a chapel. Click here to read about developing a prayer space. No, membership in the ECC+USA is not required to be a member of the OMT. Is my profession for life? Becoming a professed member of any religious order is a serious commitment to Almighty God and to that Order. While one's profession to live a life worthy of Jesus and Mary through the OMT should be a life-long commitment, there is no specific obligation required by the OMT. If I join the OMT, am I under any legal obligation to continue or support the Order? Does the OMT have any legal obligation to me once I am a member? The Order of Mary Theotokos and the Ecumenical Catholic Church+USA are religious organizations with goals to provide spiritual frameworks for individuals to grow in the service and worship of Almighty God; no other goals or proposals are suggested, offered or implied. No legal obligation on the part of the Order, the Church, or the applicant or member is established through application or profession.